Highly sensitive and less susceptible to helium saturation, Aerowing Helitest Leak Detector save aircraft maintainers considerable time and resources. Aerowing leak location processes take the guessing game out of leak detection, using patented Selective Ion Pump developed specifically for the demands of the aerospace industry. Aerowing Helitest helium leak detectors can be adapted for fuel leak detection by using the Helitest Wing Kit, complete with Class 1, Div 1 Safety Probe and Injection System, bringing convenience to a dirty job of leak chasing. Aerowing Safety Probe has been laboratory certified for fuel inside fuel tanks and in the presence of fuel vapors. 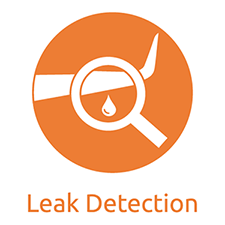 Aerowing leak detection methods can reduce leak chase time down to 1-2 hours. The Helitest Wing Kit is approved for use on all USAF aircraft in accordance with T.O. 1-1-3. The AEROWING - HELITEST WING KIT (HWK) is able to quickly locate the source of the fuel leak, inside the tank, by using helium as a tracer gas. The HWK can safely help find a leak source, in a much shorter time than traditional methods. By applying low pressure helium to the tank structure at the exit point of the leak, the helium will easily travel through the leak path and expose the location where the fuel is getting out. The Aerowing “intrinsically safe” detection probe will detect where the helium is entering the tank. This greatly reduces the amount of time it takes to repair a fuel leak. Aerowing patented Selective Ion Pump Detector has been designed specifically to give a leading edge detection sensitivity to aircraft industry leak detection tests. No helium, no leak!